Automated warehousing systems make processes more efficient, accurate and reliable. And as demand for quicker, leaner, better production continues, it’s an important competitive advantage for manufacturers. Below, we’ve listed four of the top warehouse automation trends. 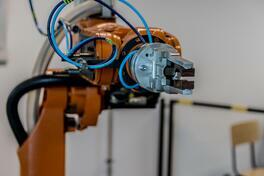 Unimate was the first industrial robot introduced by General Motors in 1961. Brainchild of Joseph Engelberger and George Devol, this robotic arm was the pioneer of factory automation. Unimate was used to speed up production and preform jobs that were dangerous for workers in automotive facilities. We’ve come a long way since Unimate. Companies like Amazon and Adidas are using robots for improved logistics and increased production. Adidas uses robot-staffed manufacturing facilities to produce shoes at a high rate, while Amazon uses robots to seamlessly sort through products and prepare them for delivery. Automated guided vehicles (AGVs) are another trend we are seeing more of inside automated warehouses. AGVs move items around warehouse facilities using magnets, lasers or vision for navigation. They also can follow wires or markers in the floor to move products efficiently around the warehouse. In 2012, Amazon acquired a robotics company called Kiva—and it currently uses 45,000 of these robots to automate picking and packaging processes inside larger warehouses. AGVs and robotics bring demand for customizable warehouse configurations. From storage containers to overall floor plan, strategic warehouse design enables the latest in automation. Boxes and bins are designed in an automation-friendly way so robots and AVGs can move them freely throughout the facility. It’s the same with shelving and racks. Shelves are being built to be more mobile and conducive to the latest in automation trends. These designs enable a more organized and efficient workspace. Customers want to know exactly where their product is as soon as they purchase it. From pizzas to car parts, customers have the ability to track just about anything they purchase. To keep up with demand, manufacturers need to trace where the product is in the supply chain. To do so, manufacturers are using radio-frequency identification (RFID) tags throughout the process. These tags allow items to move through automated warehouse management systems with greater visibility for warehouse managers and customers. Do you want to increase production and cut labor costs to keep up with the all the trends in warehouse automation? Hynes has a solution for you. Download the case study to learn how Hynes’ warehouse automation tooling project helped a customer cut installation costs and expand production capabilities.